•It is believed that the phytosterols (spinasterol and schottenol) found in Argan oil have a unique combination when compared to other vegetable oils. Rare plant sterols (phytosterols) generally help to block cholesterol absorption from the intestines and can assist in reducing inflammation. Some phytosterols also show anti-cancer properties. •Argan Oil increases the pepsin concentration in gastric juices and so aids with digestion. The flavonoids found in Argan oil act as a natural internal and external anti-inflammatory. 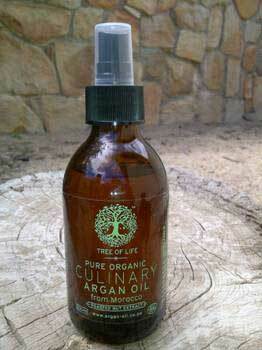 •Argan oil may be highly beneficial for rheumatic or arthritic conditions. • The oil can assist in stimulating ones circulation, building the natural immunity of the body and also help to potentially lower cholesterol levels. •Argan oil has been used to potentially prevent stretch marks during pregnancy and can help to soothe various skin ailments such as dry eczema, acne, psoriasis and chickenpox. •Traditionally tonic and aphrodisiac properties have also been ascribed to Argan Oil. Argan oil should not be heated and can be used cold over dips, pasta, quinoa and cous-cous and can even be added to soups, sauces and vegetable dishes. Try it over breakfast porridge and oats. It also makes an excellent salad drizzle. It is best to keep the oil away from direct sunlight and to refrigerate it after opening.